The study of medieval graffiti inscriptions in English churches has a long history. These interesting and enigmatic inscriptions have been studied by historians as far back as the early 19th century. However, until very recent decades these studies had all been focused upon individual churches, such as Ashwell in Hertfordshire. The few churches in which significant graffiti was noticed were considered unusual and medieval graffiti in general was considered to be a rarity. It was only as recently as 1967 that the first full-length work on the subject was written, English Medieval Graffiti by Violet Pritchard. However, as Pritchard herself admitted, the book was by no means the result of a systematic survey, but rather the sites she happened upon on her travels from her Cambridge base. The re-issuing of Pritchard’s original and unaltered work a few years ago was one of the stimuli for the Norfolk Medieval Graffiti Survey. Norfolk contains over 650 medieval churches, more than any other county in England, and yet Pritchard’s book mentioned only two as containing examples of medieval graffiti. 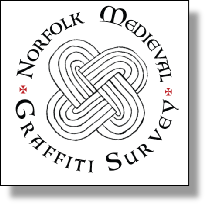 The Norfolk Medieval Graffiti Survey was established to undertake the very first large scale and systematic survey ever undertaken in the UK. The initial results have shown that medieval graffiti inscriptions are present in over 70% of the county’s churches, and opened up an entirely new and previously unrecorded corpus of medieval material.